Greg Denton has cooked for the most famous people in the world – now he cooks for himself. Denton has worked in the kitchen for the finest kitchens in America including Bouchon, French Laundry, and the CIA in Langley Virginia. Now he and his wife Gabrielle own Ox restaurant. Another appeal that comes with the restaurant is the versatility of the restaurant. Although many describe Ox as being a unique restaurant, much of what goes on at Ox comes from Denton’s experience in previous kitchens. For example, he worked for a restaurant in Ohio where the chef was very particular about chives. To this day, the way chives are prepared is very important to Denton. Along with technique and perfecting the art of running a restaurant, Denton also learned what not to do. For example, Denton saw how even four star restaurants used low end ingredients to maximize profits. Ox, on the other hand, uses the more expensive local and organic products. In fact, in the back of their restaurant they have a garden that grows enough tomatoes to serve as the only restaurants tomato supply. After working all over the country, Greg and Gabrielle Denton moved to Portland and started working at a resturant called Metrovino. A couple years after opening Metrovino Greg and Gabi left the resturaunt. Metrovino closed down a year later in late 2013. Learning from both their successes and mistakes from Metrovino, the Dentons opened up Ox. 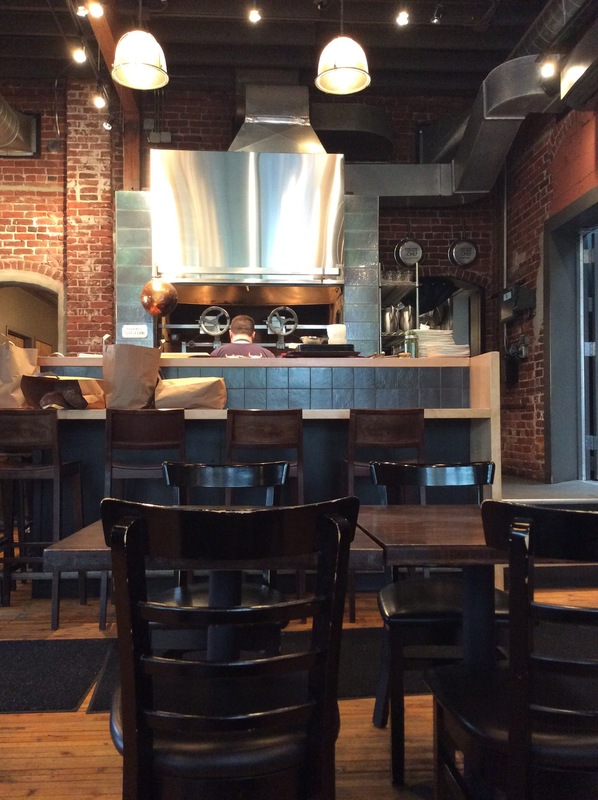 Very soon after opening, Ox received Restaurant of the Year from the Oregonian. Since then, Ox has received a variety of awards and national attention. There is one interesting thing you will find in any review of Ox. Sure, writers speak of the wonderful tastes and flavors in every dish. But every single review I have read also spends a great deal of time talking about the service and hospitality at Ox. Just as Denton looks at chives as a clue to the quality of a restaurant, he also looks at balance to find the quality of a meal. Greg and Gabrielle recently bought a high end Portland restaurant called Gruner. Their new restaurant is called Super Bite. We had an opportunity to grow our brand because as much as we would want to open up another Ox, we don’t want to dilute what is special here. When Gabby and I go out to a restaurant we order a lot of things so we can combine them into what we call a superbite. Think about going to a sushi restaurant and getting some sushi but then adding some teriyaki chicken then a fried pepper and a little wasabi and ginger and soy sauce – that’s a super bite. It’s making something that more than two or three bites would be too much but [after] those two and three bites you wish you had one more bite. Hobbies: Spending time with his wife and two dogs and eating out. Greg cooked lunch for the Dalai Lama in Maui for a couple of days while he was there. Greg is the 2006 Maui Onion Eating Champion: 2 pounds in less then 2 minutes. The restaurant’s open fire that draws so many customers. 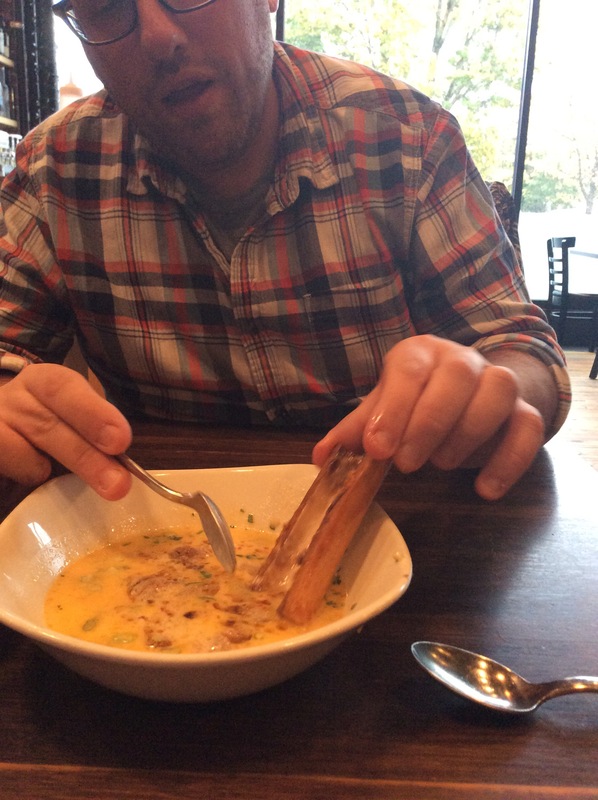 Chef Denton shows me how to properly consume the Ox bone marrow and clam chowder soup – one of their most popular dishes. 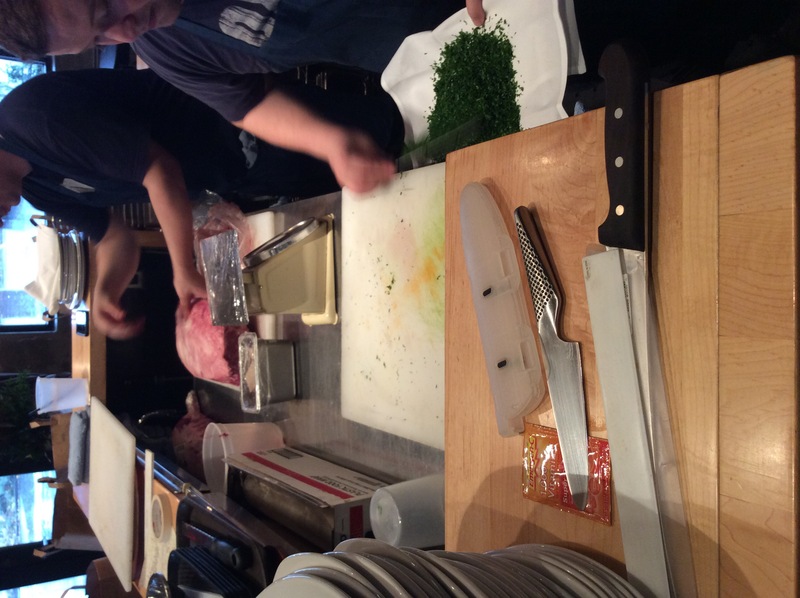 Prep chefs preparing meat and greens for a busy night. Want to see some more pictures?